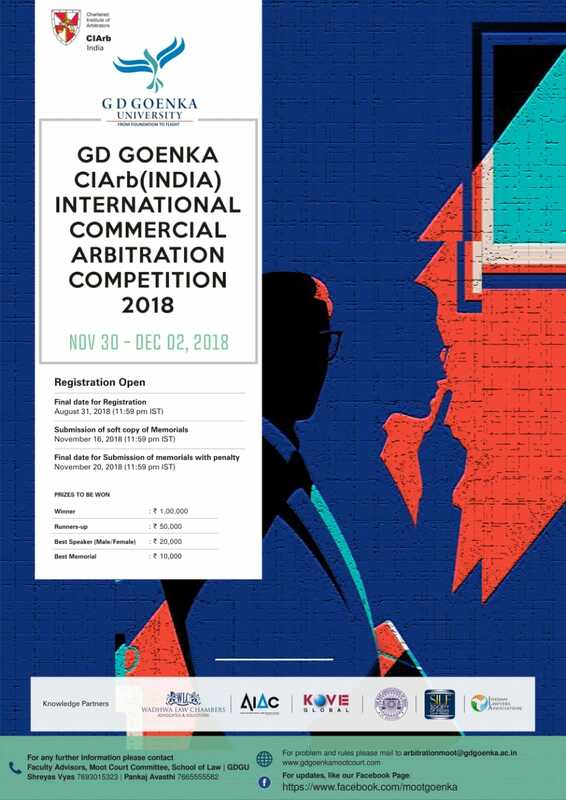 With an objective to raise the standards of Clinical Legal Education in India, the GD Goenka University, School of Law announces GD Goenka – ClArb (India) International Commercial Arbitration Competition, 2018 from November 30- December 2, 2018. GD Goenka- CIArb Arbitration Competition is based on International Commercial Arbitration Law Regime. India is a progressive and developing nation promoting fair, competitive and innovative trade practices and creating a healthy environment in the national and international market for consumer welfare and economic growth. This competition theme shall allow the participants to analyze the weak policy structures in the domestic implementation of international concerns. It further seeks to provide a gateway to reflect on solutions for similar disputes globally. Click on the below link for Rules and Regulations, Travel and Accommodation Form and Registration form. Previous ArticleIs Intelligence More Important Than Beauty For Success In Today’s Society?